VICTORY TWP. � Middle school students from 12 local schools gathered at West Shore Community College Wednesday for the 24th annual MathCounts test provided by local engineers. �It was tough, especially the last few questions,� said Krishan Patel, a Manistee Area Public Schools seventh-grader. �I didn�t know a lot of the problems, I just wanted to see if I could do it,� Sam Sweet, a Walkerville seventh-grader, said about participating in this year�s test. 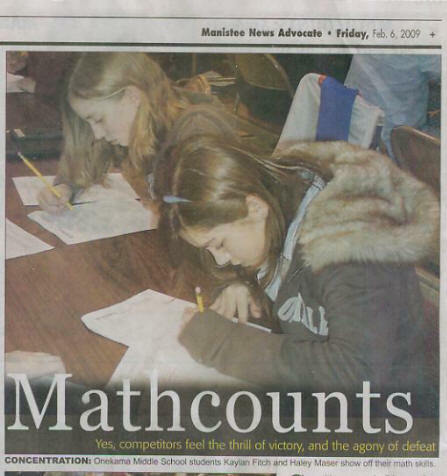 A total of 209 students � a new MathCounts record � tested their math skills against the questions developed by the engineers. They came from Ludington, Mason County Central, Mason County Eastern, Baldwin, Hart, Shelby, Walkerville, Manistee Area Public Schools, Manistee Catholic Central, Onekama, Bear Lake and Brethren. This year�s top teams were one from Hart in first place, one from Onekama in second place, one from MCC in third place and one from Manistee in fourth place, said Jim Nordlund Sr., of Nordlund and Associates, who has helped sponsor the event since its beginning. The top individual was Chris Blevins of Manistee and the Countdown Round winner was Dave Anderson of MCC. All the participating students qualify for $350 in free tuition for math classes at WSCC, Nordlund said, through the Lee B. Drelles Memorial Math Counts scholarship. The local Math Counts program was launched to promote math and engineering and interest area middle school students in those subjects. �I thought it would be a good experience, get to make new friends with the other teams and I like the competition,� Danielle Smith, a Ludington sixth grader, said about the test. Onekama had 3 students, Emily Barnard, Kelly Koon and Elizabeth Bergren, in the top 10 of individual scores. Their team, which came in second, included Emily, Kelly, Elizabeth and Curtis McKenney.